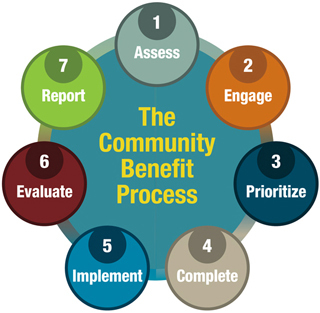 Once the Community Health Needs Assessment and Implementation Strategy are complete, your hospital will have identified and agreed upon priorities that will serve as the basis for your community benefit programs and activities. CBISA (Lyon Software) or other Community Benefit Program Software – these software programs provide a number of reports that produce detailed lists of programs/activities sorted by community benefit categories (e.g., community health services, health professions education, financial and in-kind contributions, community building activities). Form 990, Schedule H – You will document and inventory community benefit programs and activities to establish a financial value for IRS reporting. State Reporting – if you are in a state with mandatory community benefit reporting, your hospital will have collected and reported on the hospital’s programs and activities that are counted as community benefit. With one or more of these resources as your starting point, you can determine if additional work needs to be done to thoroughly document programs and activities that can be counted as community benefit. Refer to the 2008 CHA Guide for Planning and Reporting Community Benefit and the What Counts for Community Benefit website at www.chausa.org/whatcounts/ for assistance with identifying and categorizing community benefit programs. With your list of community benefit programs and activities, create a grid that matches the hospital’s community benefit programs and activities with the priorities identified from your Community Health Needs Assessment and outlined in your Implementation Strategy. Upon completion of the grid, identify remaining community benefit programs and activities that do not fit with any of the selected priority health needs. Further discussion will be needed to determine the outcome of non-matched activities. For those programs/activities that do not fit with an identified health priority, decisions can be made to refocus the program to either address the priority needs or eliminate the program.